The Hamilton Tiger-Cats announced Saturday the football club has added five international free agents to the team’s practice roster in accordance with the Canadian Football League’s practice roster expansion guidelines. The players signed include linebacker D.J. May, wide receivers Shakeir Ryan and Bralon Addison, offensive lineman Kelvin Palmer and quarterback DeVante Kincade. 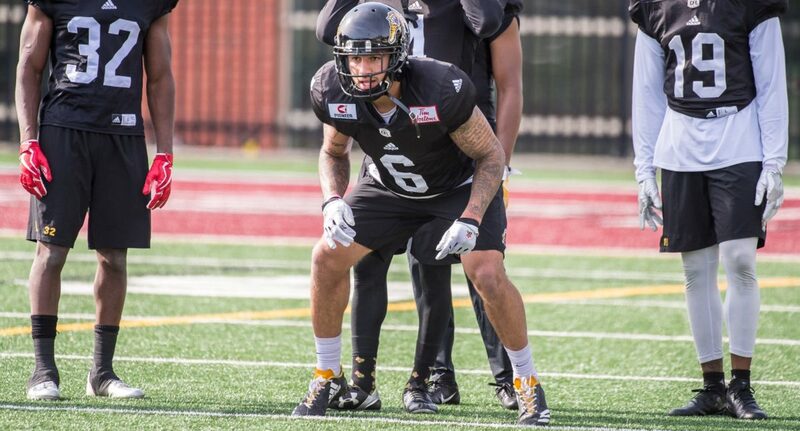 May, 24, attended training camp with the Tiger-Cats earlier this season and had two stints on Hamilton’s practice roster in 2017 after attending rookie camp with the National Football League’s Detroit Lions. Prior to turning pro, he played 37 games at running back and linebacker over five years for the University of Wyoming Cowboys (2012-16). The 5-11, 205-pound native of Federal Way, Washington, registered 133 carries for 634 yards and three touchdowns, 14 receptions for 179 yards and two touchdowns, and added 130 total tackles, 13 tackles for loss, three sacks, thirteen passes defended, two forced fumbles and two fumble recoveries. May also returned 59 kickoffs for 1,507 yards and four punts for 20 yards. Ryan, 23, attended training camp with the Tiger-Cats earlier this season after spending time with the NFL’s Washington Redskins and Los Angeles Rams in 2017. The 5-8, 169-pound wide receiver played 46 games with Northwestern State University from 2013 to 2016. A native of Lafayette, Louisiana, Ryan registered 140 receptions for 1,193 yards and eight touchdowns, and added 13 carries for 71 yards and one touchdown during his career with the Demons. Addison, 24, spent time on the Toronto Argonauts practice roster earlier this season before being released August 22. The 5-9, 197-pound native of Missouri City, Texas, played two games in the NFL with the Chicago Bears in 2016, registering one catch for 11 yards and one rushing attempt for four yards. Addison, who was signed as an undrafted free agent out of the University of Oregon by the Denver Broncos in 2016, played 39 games with the Ducks over four seasons (2012-15), posting 146 receptions for 1,937 yards and 20 touchdowns, while adding 103 rushing yards and two touchdowns on 21 carries. He also added 37 punt returns for 450 yards and two touchdowns, 12 kickoffs for 220 yards, and two Second Team PAC-12 All-Conference honours (2013, 2015) in his collegiate career. Palmer, 27, spent time with the Edmonton Eskimos earlier this season before being released August 13. The 6-4, 290-pound native of Dallas, Texas, appeared in 11 games with the B.C. Lions over two seasons (2016-17). A product of Baylor University, Palmer also spent time in the NFL with the Arizona Cardinals (2014-15), Kansas City Chiefs (2015), Pittsburgh Steelers (2015) and Tampa Bay Buccaneers (2016). Kincade, 23, led Grambling State University to an 11-2 record and their second-consecutive Southwestern Athletic Conference Championship in 2017, completing 217-of-368 passes for 2,905 yards with 23 touchdowns and four interceptions. In two seasons with the Tigers (2016-17), the 6-1, 190-pound native of Dallas, Texas, threw for 6,011 yards with 56 touchdown passes and 11 interceptions, rushed for 811 yards on 228 carries with 12 rushing touchdowns, and earned SWAC Offensive Player of the Year honours both years. He also played two seasons at the University of Mississippi (2014-15) before transferring to Grambling State.